Pam discovers Todd in Cody's room. Jim is shaving when he hears a frantic knocking on the front door. He's pleased and relieved to see Todd, who has been frogmarched across the road by Pam and Doug. 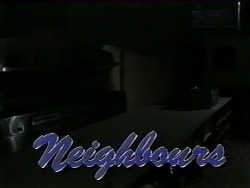 Pam apologises for Jim for not realising he was hiding in Cody's room. 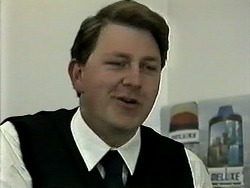 Jim wants to know why Todd didn't come to him and he explains that he was worried that Jim would send him back to Adelaide. Jim says that's just what he's going to do and Todd begs him not to. Doug is appalled that Todd has been in Cody's room for two days, but Pam says to leave Jim to deal with Todd. Jim tells Todd that he and Cody will have to learn to live without each other - he's on the next bus back! Harold is playing with Sky, giving her a piggy-back. 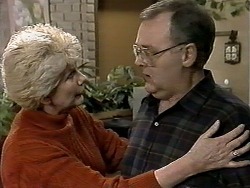 Madge asks Harold if he's planning to go back to work, but he's not ready yet. He wonders how long it will be before Sky realises that Kerry is gone. (Miranda Fryer is happily eating cereal and drinking a drink - bless!) 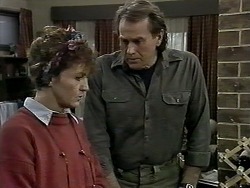 Harold tells Madge that he's going to go and see Reverend Richards again. Madge says he could try her - she's a good listener. Harold says it's so difficult this time - when Mavis died she had been ill for a long time, but Kerry was so young... He values Madge's support but needs help from a higher source too. Melissa is moaning that Paul is avoiding her. Josh says that Paul knows that he's in the wrong, so he's avoiding confrontation. Josh thinks Paul must have spies at the protest - he always seems to be one step ahead. Melissa looks thoughtful and says that Paul may have warned the tuna supplier yesterday. She determines to get Paul to read her leaflets. Cody is determined to go over to see Todd, but Pam and Doug won't let her. Just then, Todd and Jim come out of No.26 and Cody begs Jim not to send Todd home. She gives him a dramatic speech about having their uphappiness on his conscience forever(!) But Jim just tells Todd to get in the car. They drive off. Harold picks up the washing up liquid which is bio-degradable, no phsophates and not tested on animals and gets upset - it reminds him of Kerry. He's not sure where she is - she didn't believe in heaven. Madge assures him that God looks after his own. Des comes in and offers to take Sky to the park. Harold refuses at first, but realises he's being silly. Madge sends him off to visit Reverend Richards. 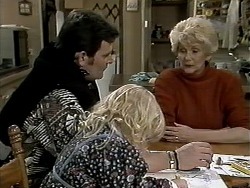 When Harold has gone, Madge tells Des that she doesn't know how to help Harold - she just keeps getting blank looks from him. She wishes he wouldn't shut her out. Todd's bus has been delayed by half an hour. Jim says he'll wait with Todd and offers to get him something to eat. Todd isn't interested, but perks up a bit when Jim gives him some money. He is devastated about having to go back to Adelaide. 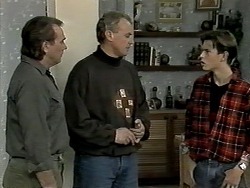 Todd explains that he and Cody were trying to hold out until Helen came back, but Jim says it's his mother's decision. Todd says that his feelings don't seem to come to it. TODD: If you want something bad enough you've got to do everything you can to get it. Even if it means hurting somebody else. JIM: Well, I can't go along with that. TODD: Then why did you split up with Aunt Bev? TODD: It's not! 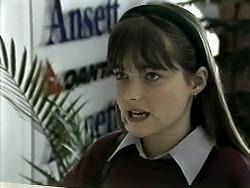 I mean, Aunt Bev knew how much she was hurting you when she left for Perth. She would have been hurting a lot more if she'd stayed and I don't think you would have made her either. Doug is reading the phone bill and grimacing. 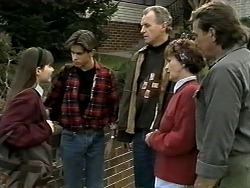 He's still cross with Cody, but Pam tells him not to be too hard on Cody - it was all completely innocent in Cody's room. Doug says there's still going to be fireworks when Cody gets home tonight! Harold gets back from Reverend Richard's place. 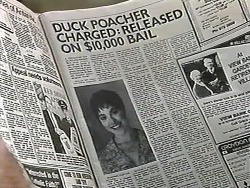 He open the paper and is shocked to see that the Duck Poacher is out on bail. He is practically beside himself. Madge reads the article further and sees that there's going to be a protest tomorrow morning by the Animal Rights People. Harold starts to cut out the article for "future reference"
Melissa tells Josh and Des that Paul has backed down - he said he was fed up of being hassled and has switched his tuna supplier. Josh wonders if they can take Paul's word for it - maybe they should check it out for themselves. He says they could sneak into Lassiter's at night and check the fridge for themselves. MELISSA: I don't know, Josh. JOSH: Put it this way, Melissa. Do you trust Paul or don't you? MELISSA: What time do I meet you? Pam is on the phone to a friend of Cody's to see if she's there - Cody isn't home yet. Doug thinks that Cody has gone to find Todd. Pam has looked in Cody's room and her moneybox is empty. Harold is on the phone to a TV programme arranging an interview. 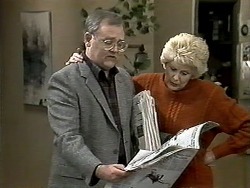 Madge is shocked to see that Harold has made up an scrapbook containing newspaper articles about Kerry's death. 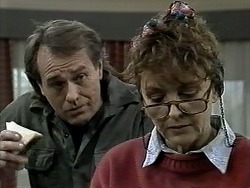 Madge tells Harold that he shouldn't go on TV - the media are like vultures and he's not in his right frame of mind. She tells him he's being unhealthy and morbid. MADGE: Listen, love. What's done is done. Now, it's a terrible tragedy, we all know that, but we've all got to learn to forgive. HAROLD:(angrily) Well, you may be able to go on with your life as if nothing's happened, but I can't! 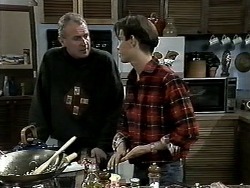 Doug comes around and tells Jim that Cody has run off. Dorothy told him that she was at school all day, so she must have gone afterwards. Doug is surprised to see that Todd is still there. He's genuinely shocked to hear that Cody has gone missing. Cody is asking the clerk how much a bus ticket is to Adelaide - it's $49. She pays for it in one and two dollar coins. Josh and Melissa sneak into the kitchens and make for the fridge. Unfortunately, a kitchen-hand comes in, so they hide. When the coast is clear, they sneak into the fridge (it's a room-sized fridge). They look for the tuna, and Josh eventually finds it. The box is unmarked, but the tuna is still from the same company - they've simply changed the packaging. Meliisa is incensed. But while they're talking, the kitchen hand comes back and shuts the fridge door. Josh tries the handle, but the fridge has been padlocked on the outside.